Australia's tour of India came to an end after the third and final T20I in Hyderabad was abandoned due to a wet outfield. After losing the Test series 2-1 earlier this year, the Aussies visited India to take part in a limited-over series. 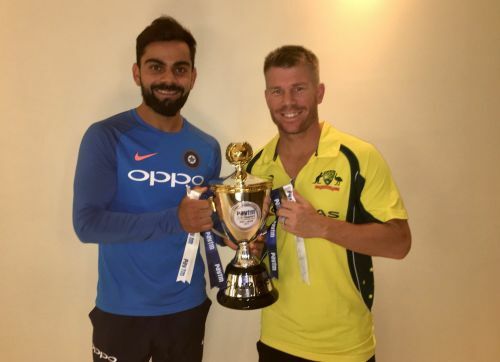 Just like the Test series, Virat Kohli and co. dominated the Aussies in the ODIs, eventually winning the five-match series 4-1. They followed it up with a big win in the first T20I before surrendering in the second match and with that, the three-match T20I series was tied 1-1. There have been a lot of positives for India in the last one month. Let us take a look at five of them. NOTE: Nothing much happened in the T20I series. So, we are just considering the positives from the ODI series. The biggest positive for the Indian team has been the emergence of 'all-rounder' Hardik Pandya. Before the start of the ODI series, a lot of questions had remained unanswered as to his ability as an all-rounder. But, he silenced his critics in the best possible manner as he contributed to the team's success with both bat and ball. He was consistent with the ball in all five ODIs and played a couple of match-winning innings with the bat. The most improved aspect of his batting has been his maturity as he has tried to play according to the situation rather than going after the bowlers right from ball one. His innings in Chennai and Indore and the consistency with the ball have proven that Hardik Pandya, the all-rounder, has come of age in the recently-concluded series in which he was adjudged the Player of the Tournament.